Stuck in the Doldrums, Uku Randmaa managed to make just 4 miles on Sunday and ended the day with his boat facing the wrong way! A race is developing for the final podium position between Estonian Uku Randmaa and the US/Hungarian Istvan Kopar. 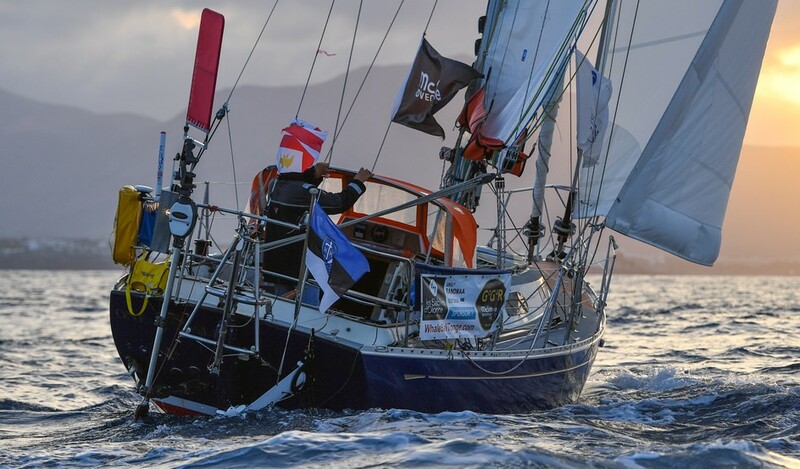 While Randmaa and his Rustler 36 One and All was struggling to cross the Equator, having managed to cover just 111 miles during the past four days, Kopar has been enjoying strong Tradewind sailing to close the gap by 398 miles during the same period. Randmaa has another problem to contend with – a lack of food. The Estonian reported that he is down to his last 29 bags of freeze-dried food and a similar number of cup-a-soups. The GGR tracking is currently suggesting a March 7 finish, so unless he can start catching fish he is now down to a daily intake of 500 calories – a quarter of what he should be consuming! For the moment, the fishing is not going too well. Race HQ has received a succession of text messages saying that a fish took his lure. He lost his last one on January 23rd. Back in Les Sables d’Olonne, Jean-Luc has tipped the scales 11kg lighter than when he set out. Mark Slats had shed 18kg. How much will Uku lose?